UPDATE 2015 GMT: Pro-opposition activists say rebels have pulled back from the 3000 Housing complex after challenging pro-Assad forces inside the area earlier today. Rebels and Jabhat Fatah al-Sham deny the Syrian military’s claim that it has retaken the village of Minyan. UPDATE 1700 GMT: The Syrian military claims that it has recaptured the village of Minyan, west of the New Aleppo district (see map). The village was taken by rebels on Saturday in the opening phase of their offensive. UPDATE 1345 GMT: Local reports indicate that rebels are attacking regime convoys trying to move from Hama Province to the Aleppo frontlines. Two convoys are said to have been attacked since the start of the rebel offensive, with destruction of a number of vehicles. The rebel faction Ahrar al-Sham and jihadists of Jabhat Fatah al-Sham are said to be leading the assaults. We can consider the regime supply line cut off. Meanwhile rebel units are hunting regime convoys on the military road from Hama. They don’t try to take and hold the regime’s only supply road to Aleppo — they just attack the convoys and make then retreat towards Hama. UPDATE 1315 GMT: Local sources report that regime helicopters have dropped chlorine canisters on the frontlines in the 3000 and 1070 Housing complexes, hoping to check rebel advances. The sources say that chlorine gas has even affected civilians in the neighboring regime-held Hamdaniya district. Earlier today — possibly to cover up the regime’s attacks or out of confusion — pro-Assad activists started spreading the story that it was rebels who used chlorine. However, witnesses report that the chlorine was from canisters in barrel bombs, possessed only by the Syrian military. The wind direction situation what made the Gaz move to its area. Syrian State news agency SANA later declared that more than 35 people were injured in the Hamdaniya area and Dahiyat al-Assad district — most of which is now held by rebels — by “shells that contained toxic gases”. UPDATE 0900 GMT: Another Iranian commander has been killed on the Aleppo front. Revolutionary Guards Brigadier General Mohamad Ali Husseini Rafi’ apparently in rebel rocketing of the regime’s Nayrab airbase southeast of the city at the outset of the offensive on Saturday. Husseini Rafi’ is said to have led a commando battalion in the Guards special forces. Iranian media outlets said the general played a major role in the battles to reach the enclaves of Nubl and al-Zahraa, north of Aleppo city, in February. Husseini, a veteran of the 1980s Iran-Iraq War, participated in Guards operations against separatist Kurdish groups in northwestern Iran. Last Wednesday, Major General Gholam Reza Smaiie was killed during an advisory mission nr Aleppo. A Syrian Army Brigadier General, Bashar Abo Hamzeh, has also been killed on the west Aleppo front. UPDATE 0845 GMT: Rebels have launched a new attack on the New Aleppo district in western Aleppo city. Rebel fighters are also on outskirts of the 3000 Housing complex just to the south (see map). The attack is being accompanied by shelling of the complex and of the Assad Academy, an important regime base for training and operations. Pro-opposition activists also report that another suicide vehicle bomb has blown up the last regime-held buildings in the 1070 Housing complex. ORIGINAL ENTRY: Rebels continued their offensive in western Aleppo city on Saturday, while Kurdish militia allied with pro-Assad forces to take Islamic State territory on the eastern side. Rebel gains on the second day of their major offensive on the western front were not as dramatic as on Friday; however, they did advance in the Zahra district following a large vehicle bomb. Rebels took several positions in the area, which has been contested for years. They pulled back from one, the Family House Amusement Park, after pro-Assad forces blew up several buildings, raising the possibility of Russian and regime airstrikes. Rebels also captured the village of Minyan, to the west of the New Aleppo district. 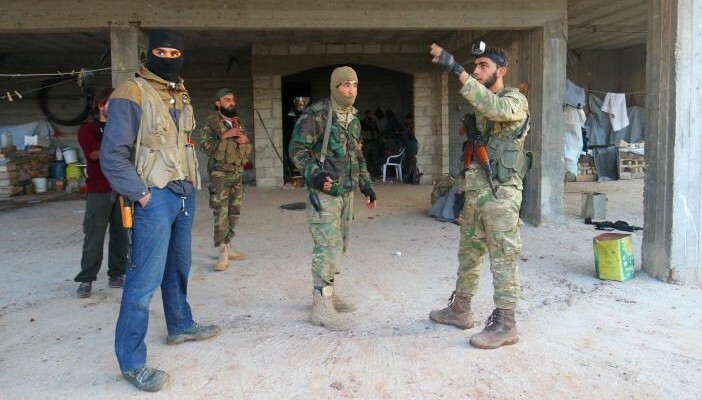 The offensive began on Friday with rebels capturing almost all of the Dahiyat al-Assad district for the first time. Pro-Assad forces tried to counter-attack yesterday, but with no reports of success. Rebels also secured almost all of the 1070 Housing complex and moved into the neighboring 3000 Housing complex. The Russia air force is still not intervening on behalf of the defending pro-Assad forces. Moscow has only briefly carried out military flights since, under political pressure, it declared a “humanitarian pause” on October 18. The offensive is just to the north of the rebel advance from late July in the Ramouseh area, which briefly broke the Russian-regime siege of opposition areas of Aleppo. The pro-Assad forces, enabled by Russian airstrikes, re-imposed the siege in late August with the recapture of a large artillery base. In another twist in the ongoing battle for Aleppo, the Kurdish militia YPG openly allied with the Syrian army and foreign militias for the first time on Saturday. The YPG joined the pro-Assad forces in the takeover of the Infantry School and nearby villages east of Aleppo city, as the Islamic State appeared to withdraw without a fight. The Infantry School is near the Sheikh Najjar industrial area. The Islamic State had held the area since last year; however, it is facing pressure from three sides — a Turkish supported rebel advance, the YPG, and the regime — to hold on to its main position in Aleppo Province, the town of al-Aab to the northeast of Aleppo city. The Syrian opposition has accused the YPG of collusion with the Assad regime this year, including the capture of the Castello Road to the north of Aleppo which imposed the initial siege in late July. The YPG have also taken territory from rebels in northern Aleppo Province and have battled rebel factions in the Sheikh Maqsoud area of Aleppo city. However, the Kurdish militia have not fought alongside pro-Assad forces in the field until now. Almost 150 White Helmets volunteers have been slain since 2013, almost all by Russian and regime attacks. Stepping up pressure on the opposition, the Syrian Army and foreign allies have captured another village in the East Ghouta area near Damascus. The pro-Assad forces moved into the hilltop village of Tal Kurdi on Sunday morning. Assisted by rebel in-fighting, the Syrian Army have captured much of the East Ghouta area since May, including agricultural land and positions for bombardment of remaining opposition territory. The latest gains are putting pressure on Douma, surrounded since 2012. The town, northeast of Damascus, is the base of the leading rebel faction Jaish al-Islam. PreviousUS Video Analysis: Will Clinton’s E-Mails Lead to President Trump?